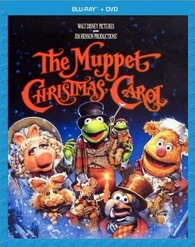 The Muppets' version of the classic Charles Dickens tale is coming to Blu-ray in November. In an early announcement to retailers, Disney/Buena Vista will be releasing 'The Muppet Christmas Carol: 20th Anniversary Edition' on Blu-ray on November 6. In the film directed by Brian Henson, the miser Ebenezer Scrooge (Michael Caine) is visited by three spirits on Christmas Eve. Specs haven't been revealed yet, but supplements will include: Audio Commentary from Brian Henson; Muppet Audio Commentary: All New Audio Commentary from your favorite Muppets – Kermit, Gonzo, Rizzo, and More; Disney Intermission: Press “Pause” and see what happens when the Muppets Show up at your door to sing your Christmas Carols – Muppet Style; Muppet Holiday Sing-Along; Blooper Reel; Frogs, Pigs, and Humbug: A Behind the Scenes Look; Christmas Around the World with Gonzo and Rizzo; and Pepe’s Profiles Presents: Gonzo, Portrait of the Artist as a Young Weirdo. Suggested list price for the Blu-ray/DVD combo pack is $26.50. You can find the latest specs for 'The Muppet Christmas Carol: 20th Anniversary Edition' linked from our Blu-ray Release Schedule, where it's indexed under November 6.